Typically, I create cute art. Occasionally I will venture away to another style. 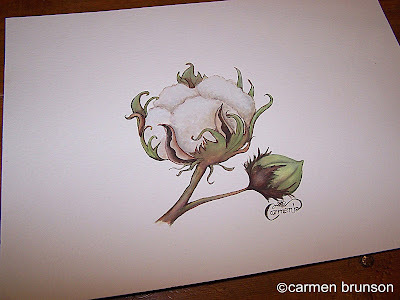 This cotton plant is not my usual style, but I thought it turned out nice, especially since I was working with a paint medium I am not familiar with. A few months back, I was talking with my art consultant Carol Eldridge. I happened to ask her what medium she prefers to work in. She said that she prefers gouache because it is so forgiving. You can visit her site here. Carol has been a licensed designer for over 20 years and does fabulous work. She also offers art licensing consultation services. You can find her art on many products throughout the giftware industry. Of course, after she told me about the paint, I just had to go out and buy some. I tried it a few months back, but was not able to spend a lot of time with it. My medium of choice is colored pencils and markers. However, today I decided to try my hand at gouache, again. Gouache is much like watercolor paint. It is a very forgiving. If you mess up you can just to dot the area with water and blot with a dry q-tip or a towel. Well off to work on something creative! Until next time~Carmen b.